In many ways, for foreign nationals, winning the US visa lottery is the ultimate American dream. More than any other country in the world, Ghanaian citizens are chasing that dream. 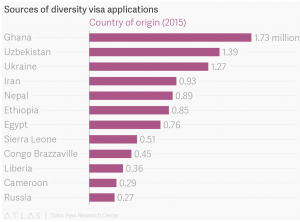 In 2015, the most recent year for which data is available, Ghana, with 1.73 million people, accounted for the highest number of applicants for the US diversity visa program also known as “green card lottery”. It’s all the more remarkable because those applications, based on US State Dept. data analysis by Pew Research, would account for around 7% of Ghana’s population of 25 million. READ MORE: National Entrepreneurship and Innovation Plan- Possible Game Changer! More populous countries like Bangladesh and Nigeria have typically accounted for the highest number of applicants over the years, but citizens of both countries became ineligible to apply in 2013 and 2015 respectively due to one of the diversity visa programs rules to ensure that various countries get a fair chance. Once at least 50,000 nationals of any country successfully immigrate to the US over a five-year period, citizens of that country become ineligible for the program. 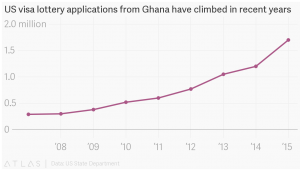 Ghana’s appetite for US visas has seen illegal visa businesses thrive. In a high profile incident last December, a fake US embassy which had operated thrice a week for ten years in Accra, Ghana’s capital city, was shut down. The fake embassy’s visas, passports and other travel documents set unsuspecting victims back by $6,000. 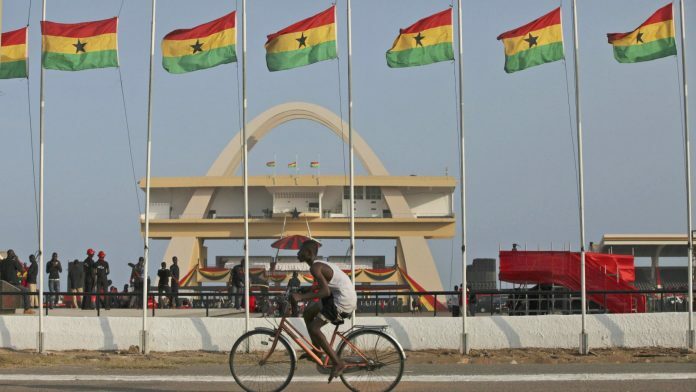 The number of people looking to leave Ghana is likely linked to the country’s economic struggles in recent years. Despite relative political stability, last year, Ghana’s economy, affected by the crash in global commodity prices, was set for its slowest growth rate in more than two decades under former president John Mahama. The economic struggles are believed to have cost Mahama a second term in office as he lost to Nana Akufo-Addo in Ghana’s December elections. For his part, Akufo-Addo has not had a convincing start in office. In a widely derided move, last month, despite promising to cut down the cost of governance, Akufo-Addo appointed 110 ministers—the largest cabinet in Ghana’s history. Previous articleBALLOONING PUBLIC SECTOR WAGE BILL AND CITIZEN PARTICIPATION IN VALUE FOR MONEY ANALYSIS.